Can Michael Robertson Buy Your FREE Speech for $250,000? 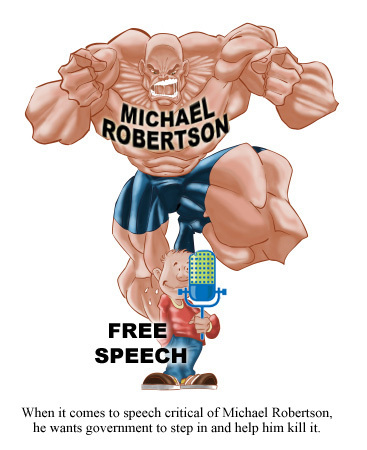 Michael Robertson thinks he's bigger than the 1st Amendment, you know, that thing that says government can't pass laws to deprive one of their right to free speech. Most countries don't have anything like our 1st Amendment, and it's one of the things that makes America so great. Robertson claims to be a champion of free speech, but when it comes to speech critical of him, he wants government (via the courts) to step in and help him kill it. Robertson has added himself to the long list of those who are trying to whittle away at the 1st Amendment, and usher in an era of political correctness where no one gets their feelings hurt by another's speech. He's the classic example of the bully who loves to dish the criticism out (see his blog, that's pretty much all he does), but can't take it himself. For those of you not familiar with the Freespire.com case, Michael Robertson has been trying unsuccessfully for nearly TWO YEARS to kill free speech on the Internet at www.freespire.com. Freespire.com is a gripe site, "dedicated to shedding light on the REAL Michael Robertson." You can read the court history here, where you'll see that Robertson has spent an estimated $100,000 to $150,000 and lost at every turn. Fortunately, the 1st Amendment isn't an easy thing to bring down, and without spending a tenth of what Robertson has spent, Freespire.com has continued to win in the courts. Some of us who worked for Robertson have a saying, "Take the smartest, most logical thing to do, and plan on Robertson doing the exact opposite." It's what makes him so predictable. What would be the dumbest thing to do here? To appeal and waste more of your money to bring attention to freespire.com. So, what can we expect from Robertson...you got it. Mark my words. I'm confident enough in our 1st Amendment (and Robertson's incompetence in attacking it), that I'm going to put my free speech to the test. I will not spend one penny on this case. I have already released Gil, my lawyer who had done such a great job on this case up until now. Even though Gil easily won this case on a very small budget, I believe one should be able to defend their free speech for, well, for free. Let's find out if it can be done. I'm going to represent myself in this case, or with the assistance of any unpaid, "free" volunteers. If I win, then our 1st Amendment is alive and well. Should I lose, then I guess free speech isn't so free after all, and bullies like Robertson can buy yours for around $250,000, and we'll have to start calling it "quarter of a million dollars speech," instead of "free speech." So, choose your team. Team Robertson or Team Free Speech. Let me know who you'll be cheering for. Who knew all those years ago when I decided to name the Freespire OS by that name, it would take on a much greater meaning, that of an American's right to FREE speech. Long live FREE Speech, and long live FREEspire.com!